LAS VEGAS, NV -- (MARKET WIRE) -- October 13, 2006 -- After reaching international success with the replica of The Welcome to Las Vegas Sign, Bogar Enterprises, LLC is launching four new themed souvenir products honoring additional recognized icons that represent Las Vegas and one of Las Vegas' most loved performers, Elvis Presley. On the heels of the original sign's success, Bogar has developed two new products licensed by Elvis Presley Enterprises and one product with VEGAS.com. 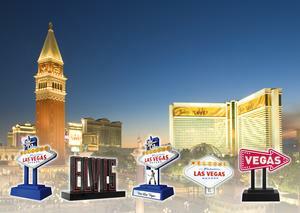 The company is also offering The Welcome to Las Vegas Sign replica as a night light. The original Welcome to Las Vegas Sign replica has taken on a new look, honoring Elvis Presley's life in Las Vegas. Bogar Enterprises has added Elvis singing "Viva Las Vegas" to the already successful Welcome to Las Vegas Sign, keeping the same iconic flashing lights and famous flashing star as the Welcome to Las Vegas Sign, and adding a 30-second clip of Elvis's hit song, an Elvis photo and a shiny plaque that reads "Viva Las Vegas." The ELVIS '68 Comeback Special Sign is a replica of the towering backdrop when Elvis performed his NBC television special, popularly known as "The '68 Comeback Special," which aired on December 3, 1968. The special was one of the biggest television hits of the year. The ELVIS '68 Comeback Special Sign features white Light Emitting Diodes (LEDs) that display red lights just like the backdrop sign used on stage in 1968. Bogar's replica adds a 43-second sound chip playing another one of Elvis's most recognized tunes, "Don't Be Cruel." Bogar's other new sign is a modern interpretation of a Vegas icon using the famous red arrow. The VEGAS.com-inspired sign lights up, flashes and points the way to Vegas. The sign features white LEDs around the border and yellow LEDs in the word VEGAS. The sign's red arrow is based on the VEGAS.com logo, which has become one of the most recognized symbols representing Las Vegas. "Our original sign was very successful with tourists and locals -- they loved it. We wanted to build on the interest in the souvenirs and introduce new products that are representative of Las Vegas," said Bob McMonigle, Owner and President of Bogar Enterprises, LLC. McMonigle continued, "No similar products exist and we are confident the new products will become just as popular as our original sign." The ELVIS '68 Comeback Special Sign and The Welcome Viva Las Vegas Sign have a suggested retail price of $49.95. The Welcome to Las Vegas Sign has a suggested retail price of $39.95. The VEGAS Sign has a suggested retail price of $29.95 and the Welcome Night Light has a suggested retail price of $9.95. These products can be purchased in casino gift stores, hotel gift stores, specialty stores and souvenir shops throughout Las Vegas. All products are available for purchase now, with the exception of the ELVIS '68 Comeback Special Sign, which will arrive in stores later this year. To purchase the signs online, visit www.LVSignCo.com. Bogar Enterprises, LLC (www.LVSignCo.com) is a leader in the novelty sign business, creating souvenir products honoring icons recognized in Las Vegas and around the United States. Operated by Founder and President Bob McMonigle, Vice President Robin Roberts and Consultant Gary Wilkos, the company is internationally recognized for its Welcome to Las Vegas Sign. Since its debut nearly two years ago, the Welcome to Las Vegas Sign has become the most popular Las Vegas souvenir on the market, and voted the No. 1 souvenir by the Las Vegas Review-Journal in 2005 and 2006. Sold in retail outlets across the country and online all over the world, the original Welcome to Las Vegas Sign continues to gain popularity among consumers and celebrities alike and is now joined by The Welcome Viva Las Vegas Sign, the ELVIS '68 Comeback Special Sign, the VEGAS Sign and the Welcome Night Light. Elvis Presley Enterprises, Inc. (EPE) is based in Memphis, with additional offices in Los Angeles. In addition to Graceland and its related attractions in Memphis, including the Heartbreak Hotel, EPE is aggressively involved in a worldwide licensing program, merchandising, music publishing, and television, film, video and Internet projects. For more information on EPE and Graceland, visit www.Elvis.com. EPE is a subsidiary of CKX, Inc., a publicly traded company listed on the NASDAQ National Market System (NMS) under the ticker symbol CKXE. These products are available through Bogar Enterprises <br>www.LVSignCo.com.